Performance Testing Services | BlackHatWing, Inc.
Every time software code is modified, it has to be tested manually to ensure quality. With increasing codebase and added functionality, manual testing turns laborious, inefficient and costly. 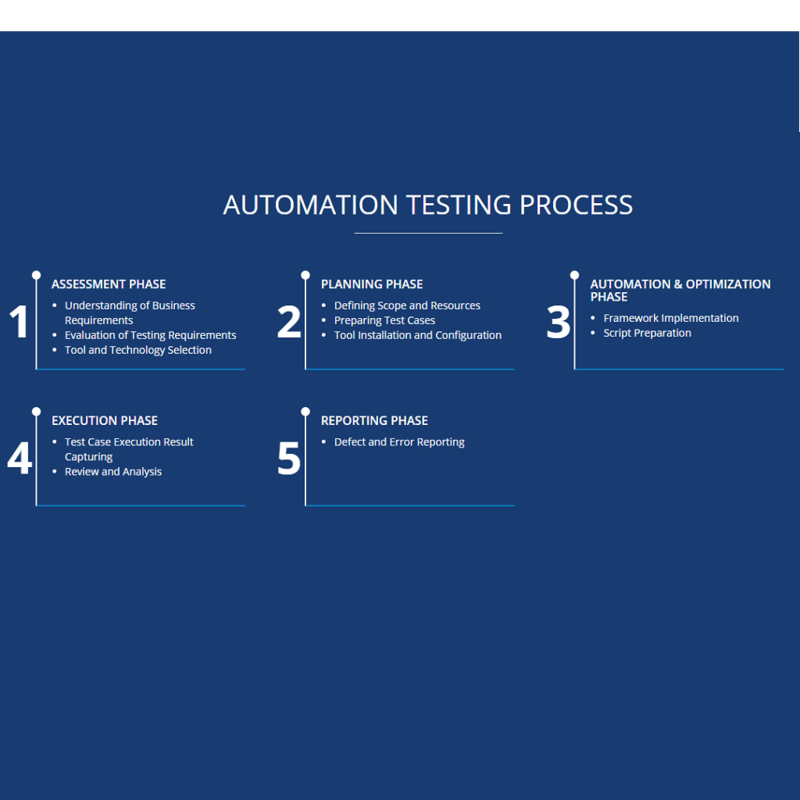 Automation testing helps automate highly repetitive test cases to provide testing coverage on core business processes, cutting costs by up to 40% and reduce test times by over 20%. Why Automation Testing? Automation testing is for every organization creating apps across web, mobile or enterprise desktop platforms that require frequent manual testing. Reduce overall test analysis cost due to less involvement of manual work. Reduce development time due to increased testing speed. Enhance software quality, as it removes the possible human risk during QA process. Optimize resource usage by reducing the time required to execute test. Allow testers to reuse library of test assets that can be quickly executed. Improved efficiency, shorter test cycles, and increased test coverage by automating repetitive tests. We help you design and implement an automated testing strategy for your organization and ensure that there is an operational plan in place to maintain it. Test scripts developed stay the property of clients and we provide guidance to enhance them when needed. We have extensive experience in Education, Retail, Government and Media verticals. We have also helped many of our Fortune 1000 clients with software automation testing script development. Automation engineers at Kualitatem have expertise in various tools including, Selenium (C/C++, C#, .NET, Java, Visual Basic, Python and PHP. ), Borland SilkTest, HP UFT/QTP, Rational Functional Tester, Monkeytalk, Robotium, Rational Robot, Telerik Test Studio. Functional testing is a pivotal element for strengthening the quality of developed software. 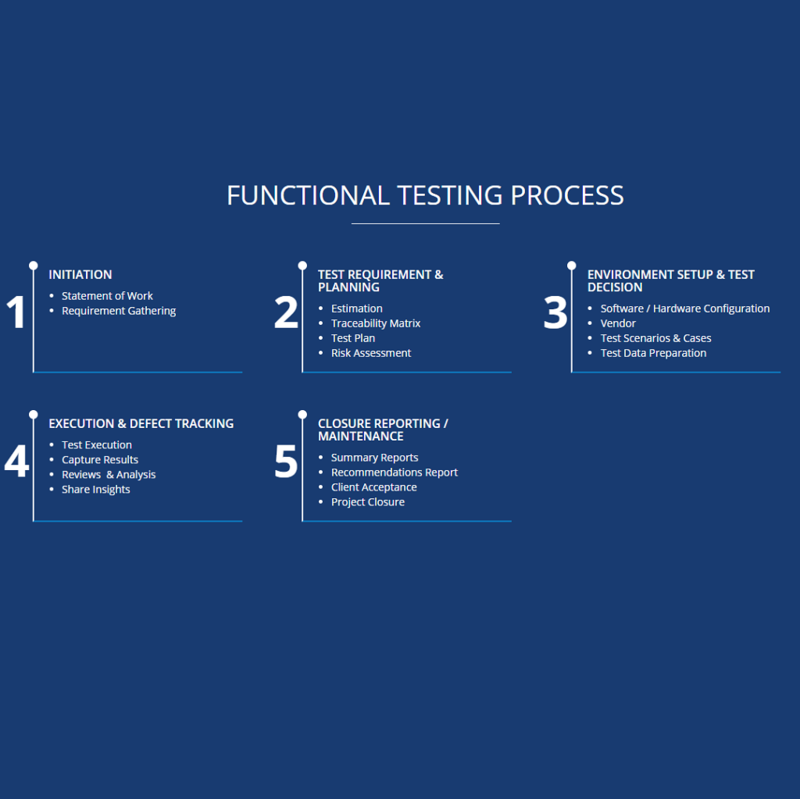 Functional testing basically refers to the black box testing that evaluate a particular IT product with reference to the functional requirements indicated with its specification. Functional test analysis process involves the testing activities which measure the code of each component to assure quality. Why Functional Testing? Functional testing is for every organization to maintain the functionality of their systems & ensure stability in results. Functional testing enhance user experience by removing out functional bugs in settings. Allow QA team to correct module collaboration of a system according to its specified requirements. Deliver the output data, by comparing actual and expected results of an IT infrastructure. Clear the identification of different functions and how they affect other functions. Test units of each system to validate interaction of each component & deliver expected output. Smoke, Acceptance & system testing ensure accurate testing results related to bugs. Our approach starts with exploratory testing where our team plays around with the application. Based on their experience, they gradually get methodical, develop a scenario matrix and execute all possible test cases to assess application quality. We have extensive experience in Education, Retail, Government, Media & Financial sector. As Functional testing services firm we helped many of our Fortune 1000 clients with functional testing script development. BlackHatWing will support you in pursuit of perfection and higher ROI. Our fully customizable functional testing services are ready to meet any & all challenging end user requirements and pressing timelines. Often times, great apps fall victim to their own success. If 20,000 concurrent users suddenly start accessing an app, it can bring even the best apps to its knees. Performance testing helps to find out the bottlenecks impacting the quality and the caliber of an IT system to perform under heavy loads. Why Performance Testing? Performance testing determines the responsiveness, throughput, reliability, and scalability of a system under given workload. Assess production readiness of an IT system to achieve performance goals and requirements. Performance testing Compare performance characteristics of multiple systems. Find the source of major performance vulnerabilities impacting the desired performance quality. Collect other performance-related data to help stakeholders make informed decisions. Ensure the hardware configuration is suitable for the application’s performance. Performance testing frameworks evaluates the quality of an IT system against performance criteria. Our processes and tools offer powerful, realistic load tests for thousands of users running business scenarios across a broad range of enterprise application environments, providing you with practical diagnostics and solutions to resolve performance issues. We have extensive experience in Education, Retail, Government, Media & Financial sector. 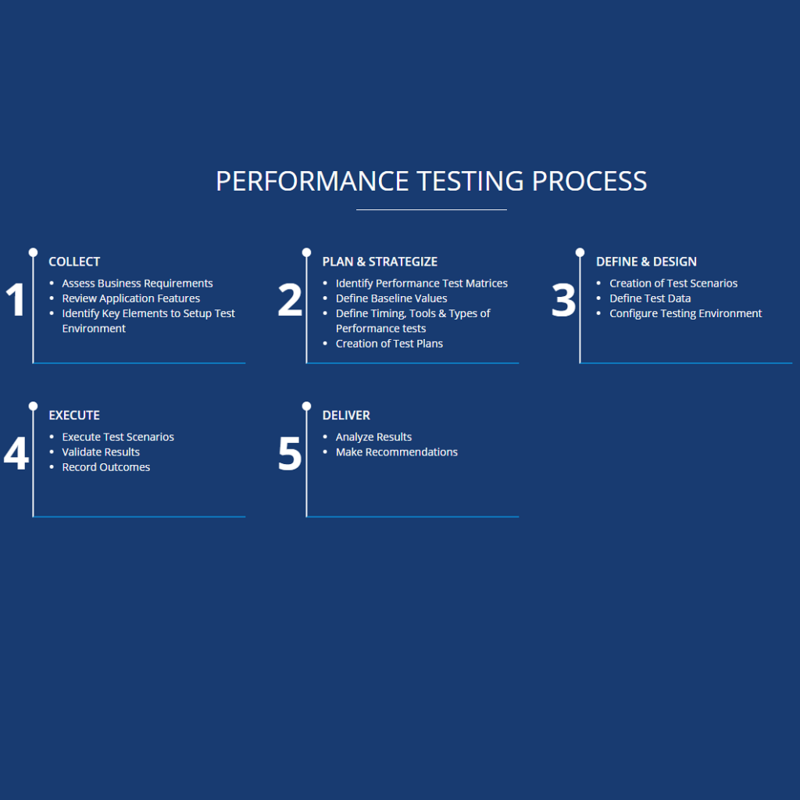 As a performance testing company we helped many of our Fortune 1000 clients with software performance testing script development. We can help you to create a performance testing solution for varying application types and budgets, through extensive exposure to several commercial and open source tools like LoadRunner, WebLoad, QALoad, SilkPerformer and Jmeter. Enterprise desktop solutions require an altogether different approach as they are usually mission critical. With extensive user base using different modules in real time, it’s important to understand the user acceptance, performance and security of such applications apart from functionality. Determining the right mixture of testing approaches to apply within costs and schedule constraints is a key scoping factor for many modern enterprises. 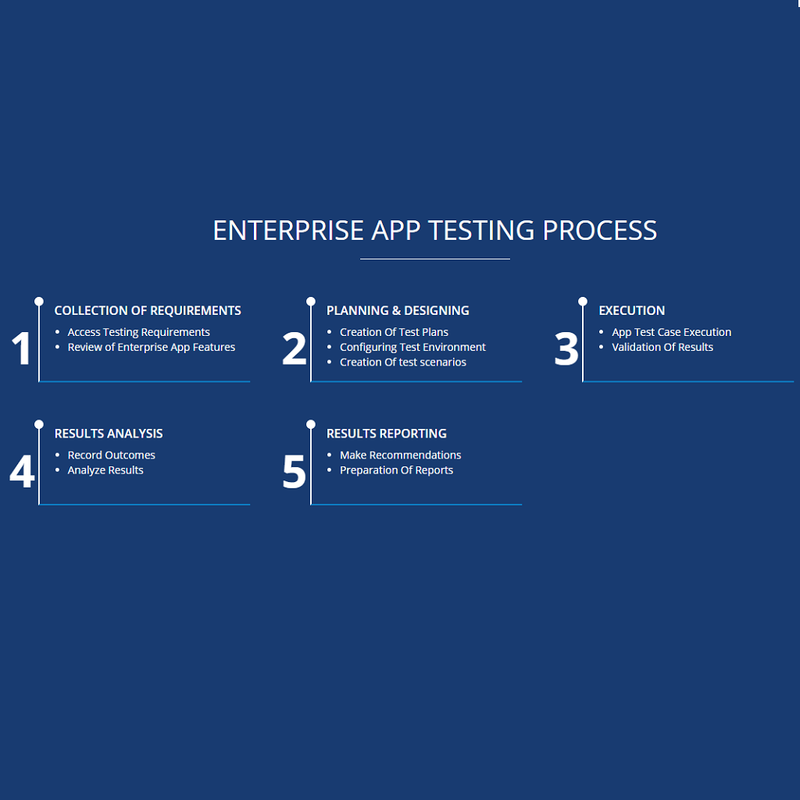 Why Enterprise App Testing? With extensive user base using different modules in real time, it’s important to understand the user acceptance, performance and security of such applications apart from functionality by employing Enterprise App testing protocols. Enterprise App Testing make a system fully reliable by enhancing its performance and load tolerance. It will make sure that system recovers to a stable state after a crash and no data is lost or corrupted in this transition. Ensure the perfect Interdependencies between various business layers, relational mapping, and smooth flow of data. An Enterprise App will be completely secured if its proper automated and manual security scans are carried out via enterprise app testing process. Automated enterprise app testing process reduce the overall time required to analyze bugs & vulnerabilities. Our pre-defined automation frameworks and test specifications help to find the highest number of defects at the shortest possible time. Our standard SAP & Oracle testing methodology, hybrid automation frameworks, readily available templates for test strategy, test management, guidelines and checklists are perfectly resourceful to conduct Enterprise App test analysis. We have extensive experience in Education, Retail, Government, Media & Financial sector. As an Enterprise app testing services firm we can help many of Fortune 1000 companies with App testing script development. We create the right mix of Manual & Automated Testing to optimize testing budgets and maximize ROI. Our Experienced Functional Consultants have rich work profiles built through delivering world class test solutions to global enterprises. We use HP ALM, HP Quick Test Professional, IBM Rational Functional Tester, IBM Rational Performance Tester and HP Load Runner / Performance Center. Want to get in touch? Signup the form below to find a BlackHatWing office near you. For fast answers to your questions, complete this form and our representative will contact you within 24 hours. Or schedule a meeting, call us at (323) 473-3145. Address: H#42, Street#49, G13/2, Islamabad. Copyright © 2018 BlackHatWing, Inc. All rights reserved. including asset discovery, network security, threat protection, compliance monitoring and web application security.